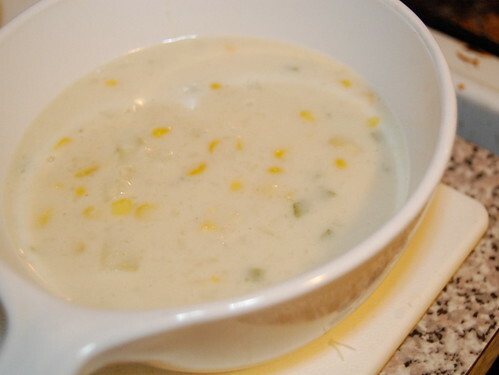 When life gives you frozen corn, make chowder. Okay, I haven’t been a very good food blogger of late. Truth be told, there’s been some belt-tightening going on in Maison Gezellig. Nothing dire, just finding we need to cut back on some expenses and food is one of the easiest places to start. Unfortunately, making dinner out of whatever you find hanging around isn’t a recipe for exciting food blog posts. Or, as it turns out, for especially alluring food photography. Which is a shame, really, because this corn and potato chowder was one of the best things I’ve made recently. Even my kid, who usually can’t even remember where she left her shoes an hour ago, saw me editing this photo from last week and remarked on how good this soup was. The soup was born from the packages of frozen vegetables that my husband always brings home from the grocery store. There are a few exceptions, but in general, I hate frozen vegetables. They’re always a sad reminder of how they once were before being frozen. Fortunately, for me and my freezer, this soup makes up for it. Mince one medium onion. Saute in two tablespoons butter until onion is soft. Peel and grate one medium potato. Add about 2 cups broth, enough to cover the potato and onion. Simmer potato and onion until both are cooked through. Meanwhile, dice two more peeled potatoes and a couple stalks of celery. Thaw and rinse one 10 oz. box of frozen yellow corn. Once the potato/onion mixture is soft, puree with a stick (or regular) blender. (This makes the soup creamier without adding actual cream, which I never have on hand.) Add the remaining vegetables, 2-3 cups of milk, a couple bay leaves and a big pinch of nutmeg. Simmer uncovered for about 30 minutes, stirring frequently to be sure the milk doesn’t scald to the bottom of the pan. Salt to taste. Serve as is, or with a little grated cheese. Yum! Soup! I love soup. I am the queen of soup. Here is my own unattractive but derriciouz chowder recipe! I know! In fact, your recipe came up in the results when I was searching, and I had a hey, I know that person! moment. In the end, yours was one of the couple of recipes I referred to in making this. This sounds delicious, Kristen, warming and comfortingly simple. And you’re right about how puréeing the soup thickens it without cream. Not only do you not have to have cream around, you don’t end up with lots of added fat.